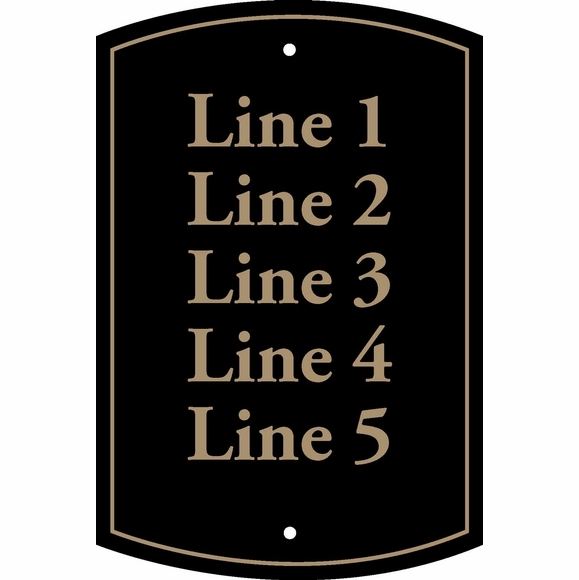 Home > Address Plaques > Address Signs > Custom Sign With 5 Lines - Multi Unit Address Numbers, Room Numbers, Building Numbers, Text, etc. Custom Sign 5 Line 12x18 Wall Plaque - - says whatever you need to say on five lines. Enhanced rectangle wall plaque personalized with the wording you supply. Perfect for multi number address units and often used for building numbers, room numbers, private property, no cell phones, smile you're on camera, no drone flying, etc. Made in USA. Crisp border accentuates the distinctive hybrid shape. Large image shown in black with gold metallic.